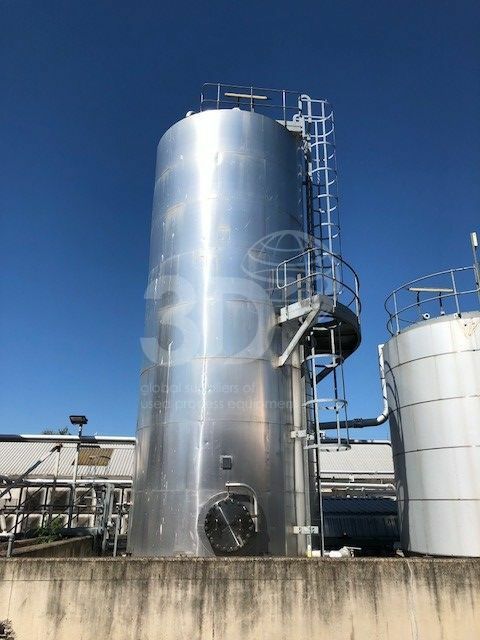 Used 100,000 Litre Stainless Steel Storage Tank, manufactured by Able Engineering, 2008. Material of construction: 316L Stainless Steel. Orientation: vertical, cylindrical, flat bottom, tented top. Dimensions: 3700mm internal diameter, 9510mm on the straight, 11684mm overall height. Design data: design code G.E.P, atmospheric design pressure, 40degC operating temperature. Tank is trace heated and lagged with 50mm rock wool insulation and clad with aluminium sheets. Tank is fitted with a top mounted triple flighted turbine agitator, side ladder and top walkway.